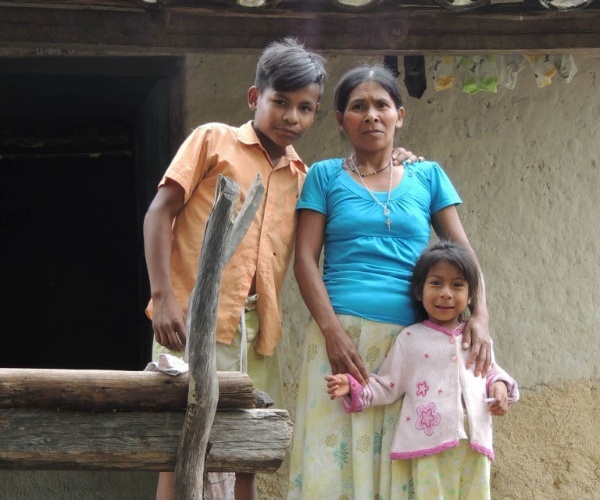 In the indigenous Lenca village of El Ocotal lives Maria Corea and her two little kids. She was widowed a year ago and has struggled with providing for her family. They live in a little house with no electricity and only one bed for their furniture. Maria does have the modern convenience of running water that comes on two days a week. Yet, she didn’t have any way to store the water for the rest of the week until this last month. Pastor Mario Corea and two other pastors from nearby villages decided to work together to serve Maria and her two kids. With the nearest hardware store 15 miles away and no delivery options available because there is no road that directly accesses the village, he personally carried all of the material by vehicle as far as he could. Then Pastor Mario either hand carried or used a donkey to carry the material the rest of the way to the village. In September, Mario built his first pila (water storage unit) for Maria and her two kids as a way to serve them and share the gospel of Jesus. Maria is so happy that she can hardly believe that she is the new owner of a pila! Please pray for the church in El Ocotal and in the surrounding villages that they can help more families, share the gospel, and see people trust in Jesus.